A caucus is a meeting of a group of persons in the same political party who select candidates or decide policy. As opposed to a primary, a caucus is a party-organized meeting of neighbors who discuss issues and candidates. Held every election year, the caucus provides an opportunity for grassroots activists to influence the Republican Party of Iowa’s platform, become members of the county’s Republican central committee, run for a position as a delegate to county convention, and, in presidential years, cast a vote in favor of a Republican candidate for president of the United States. The 2016 Iowa caucuses garnered record participation, with more than 187,000 Iowans joining their fellow Republicans in more than 700 locations across the state.The Republican Party of Iowa led the most robust effort in memory, with all precincts reporting by 11pm CST, and all results physically verified within 48 hours despite a crippling snowstorm. The caucus process has been used since Iowa became a state in 1846, but Iowa’s First-in-the-Nation status did not gain its current political and media prominence until the early 1970s. Caucus meetings for both political parties are held every other year, and prior to 1972, Iowa’s caucuses were held during the middle of the primary calendar. In 1972, the Democratic Party moved its caucus from the early spring to January. That year, George McGovern took advantage of Iowa’s First-in-the-Nation status to generate attention during his bid for the presidency. 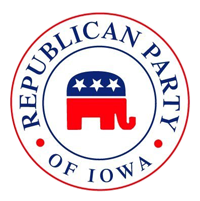 In 1976, the Republican Party of Iowa also moved its caucus earlier to coincide with the Democrats. Political and media attention focused acutely on the caucuses in 1976 when a virtually unknown candidate from Georgia won the Democrats’ Iowa caucus. Jimmy Carter instantly became the frontrunner and eventually won the presidency that year. Since then, the First-in-the-Nation Iowa Caucus has increasingly generated media attention and political influence. Presidential year caucuses provide a unique opportunity for Iowans to impact the nomination of the Republican candidate for president. Iowans take their position as the first citizens to cast a ballot for their party’s nominee very seriously, attending campaign events throughout the year to ask questions of the candidates and weigh their stance on the issues. In addition to casting a vote for the party’s presidential nominee, the caucuses also fulfill critical intraparty business. In all precincts, individuals are elected to the county central committees, delegates are chosen to attend the county conventions, and platform planks are submitted and voted upon to be considered in the county Republican platform. The 2018 Iowa Caucuses will be held at 7:00pm on Monday, February 5th, 2018, in all of Iowa’s 1,681 precincts.